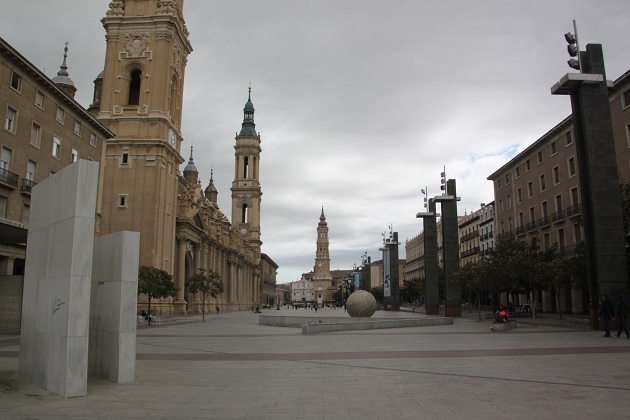 Walking down the main shopping street towards this square in the heart of Zaragoza, I knew we were in for something special. The domes of the basilica tower above the other buildings, the view is just breath-taking. Son was a bit obsessed by the dustbins along the street, but you have to admit, even they are easy on the eye. Our first experience of the square was on Palm Sunday when we arrived. A large procession of Easter brotherhood filled the whole place with their masks and beating drums – quite an experience for us just freshly off the plane. We revisited the square many many times and most days during our visit – just to gaze at that incredible church, to eat ice-creams at the fabulous cafe opposite the basilica and to watch more of those mesmerizing processions. The square is seriously impressive – one of the longest apparently in Europe. 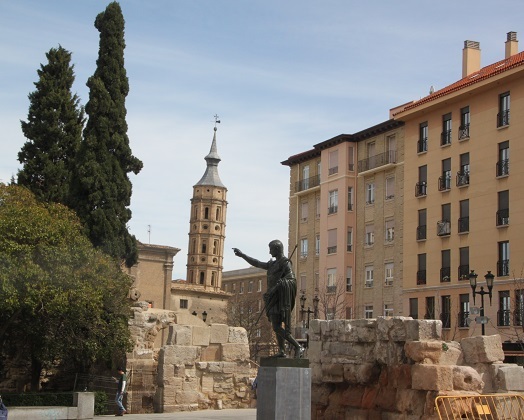 It is lined with magnificent monuments, modern fountains at one end and has no end of wonderful buildings but it is entirely dominated by that amazing multi-spired basilica dedicated to the Virgen del Pilar and with murals by Goya. 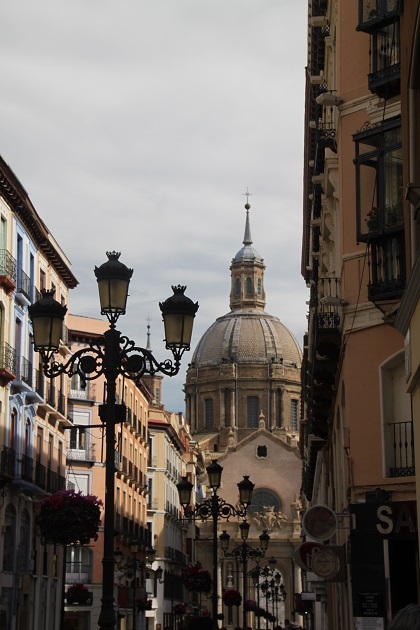 Next door to the basilica is La Lonja, a Renaissance stock exchange building now a gallery and at the other end is La Seo Cathedral. Unfortunately despite several attempts by us to visit and see inside, every time we got there it was always closed. We had to be content with admiring from outside. That is actually pretty special anyway. 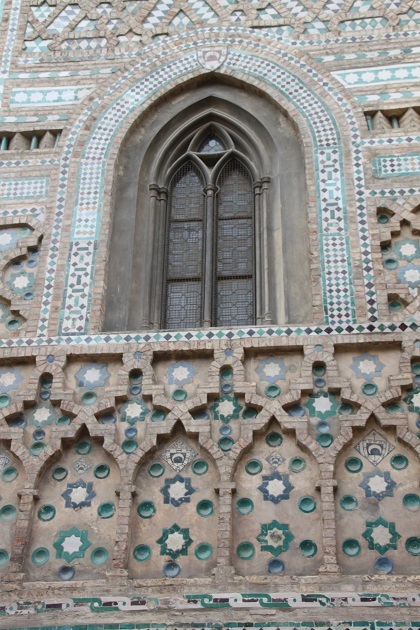 The pillars and detailed exterior are dazzling. 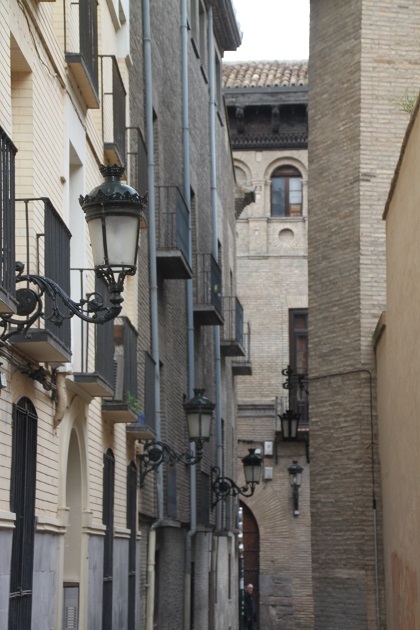 One thing we found difficult to get used to here in Zaragoza – at 2pm the streets became completely deserted and only around 4.30 were there signs of life starting to appear again. Son was never in the mood for a siesta but it did at least allow us to explore the city without any crowds (or people at all mostly). At the bottom end of the square near La Seo is a glass pyramid like construction. We peeked in and chatted to a very friendly man, all of us excited about going down the escalator and into large sections of the Roman Forum and ancient Roman drains. Excitement levels were crushed though – due to flooding the Roman remains were inaccessible so we didn’t get to see them. 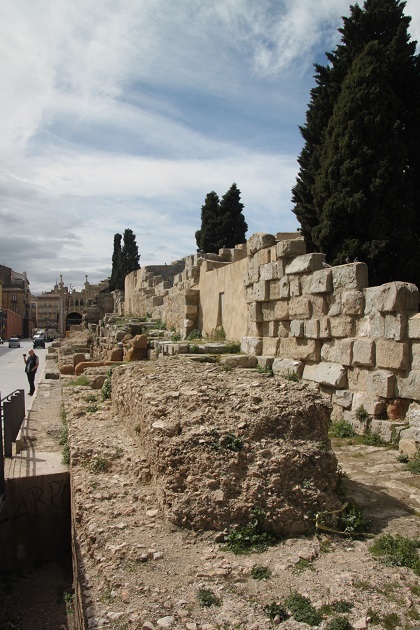 We did manage to see the Roman Walls – very close to the square and we also saw the Teatro Romano (Roman Theatre) discovered in 1972 when they were excavating a building. 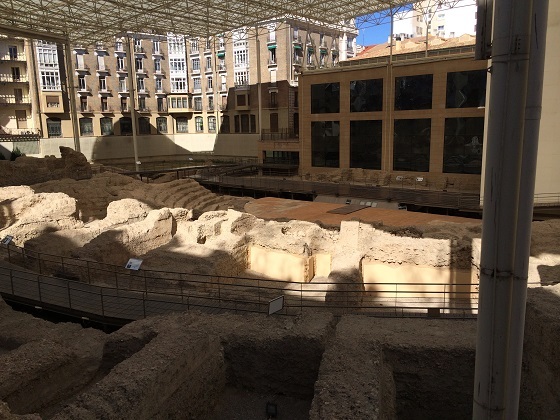 We would have loved to visit the museum and explore these ruins properly. Time constraints kicked in so we had to make do with admiring from the street – you do get a great view from here. The theatre once housed 6,000 spectators and apparently great efforts have been made to help visitors reconstruct the former splendour of this building. After exploring the square we also had a stroll around the market hall. Not on the scale of Barcelona’s La Boqueria but interesting nonetheless. Son looked at the vast amounts of tripe in disgust but we were all more than happy with this strawberry purchase. 1 Euro for a box of these beauties – how great was that! 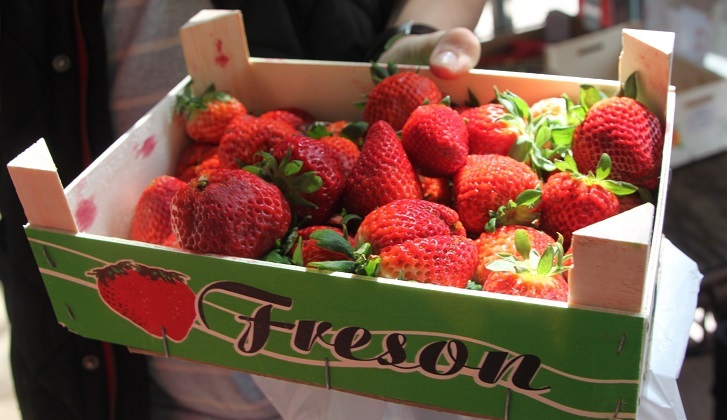 It looks to be a very attractive city and if only we could buy such a big punnet of strawberries for just over a £1 ! I know – 1 Euro for all that – unbelievable for us here!! It is such a gorgeous and off the beaten track to visit, we loved it and would highly recommend!! What an interesting surname too…. 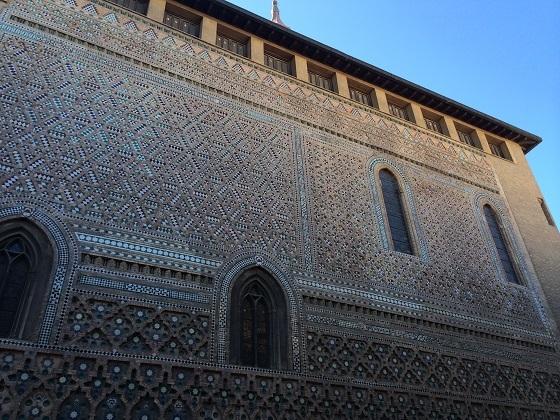 just googled it and they say it originates in Saragossa or Zaragoza – great fact!! Not somewhere we’d ever thought or planned to visit Suzanne but having now been I can definitely recommend it most highly! what are those two big statues? 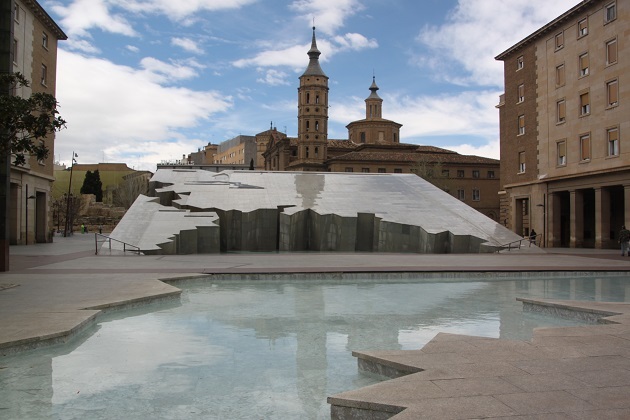 There are a whole series in the square – I think they are to commemorate Goya and his connection to Zaragoza. Thanks for reminding me that I need to to Zaragoza. I nearly got there once but was over ambitious on travel distance. It is quite a distance from everywhere else – I was surprised how far from Barcelona. 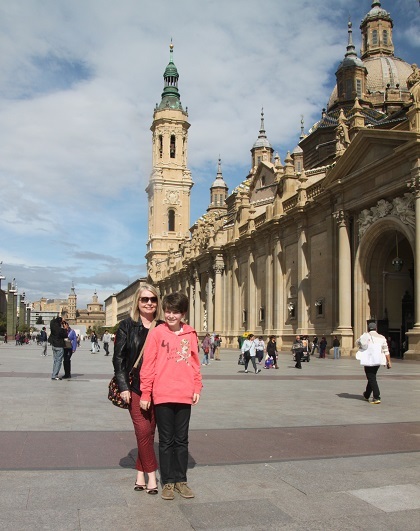 It is well worth a visit though, a beautiful city and the tapas pub crawl is a real highlight! I am going to Granada next week but I won’t attempt to drive from there! No – a bit of a big journey!! Looking forward to reading about it, we went there before our son was born, I’m sure reading your posts will be tempting me to return. Some of it looks slightly moorish which surprises me. 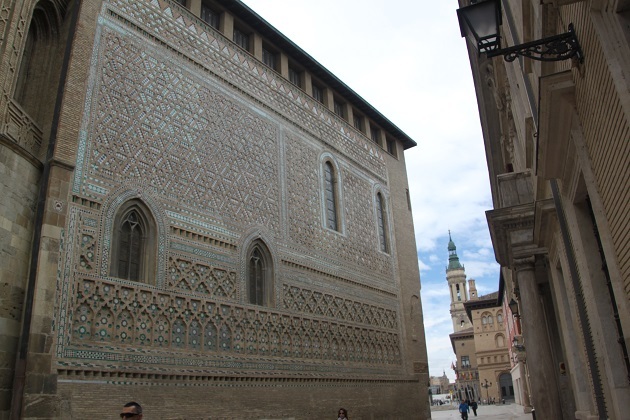 There is lots of Moorish architecture here – apparently all through Aragon as well – it’s stunning. Wonderful photos, Joy. 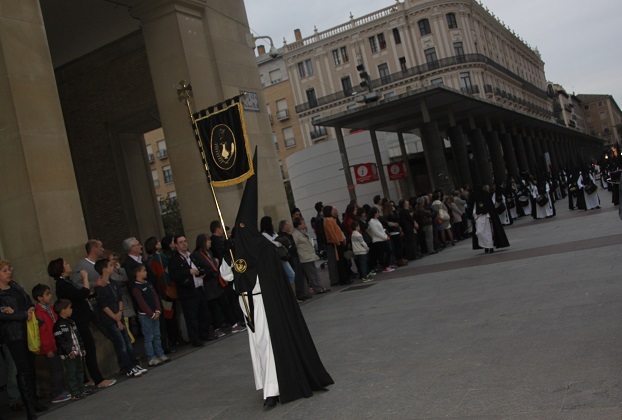 The Spanish do brilliant processions during their fiestas. Absolutely Susan – they’re great to witness and watch!! A wonderful, rich and as you said, gorgeous square, very nice pics. It is just beautiful, we loved wandering after lunch when we had it all to ourselves. Looks like a fun place to explore. The building and architecture are outstanding, there’s so much to see and the bonus extras of churros and ice-cream shops make it even better! 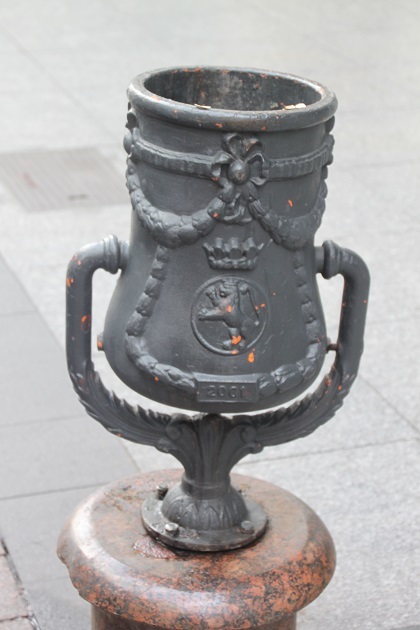 Your photos are so lovely and I loved reading about this off the beaten track city! Thank you Hilary – it really is a great place to explore and nice that it is off the beaten track – we felt like it was our little secret gem! Joy, I have enjoyed your photos of a place I had never heard of. The basilica is stunning! I love to explore new places! Me too Pam, this was a really special place – well off the beaten track but simply beautiful. We loved it too – the tapas was incredible – couldn’t get enough of it!! 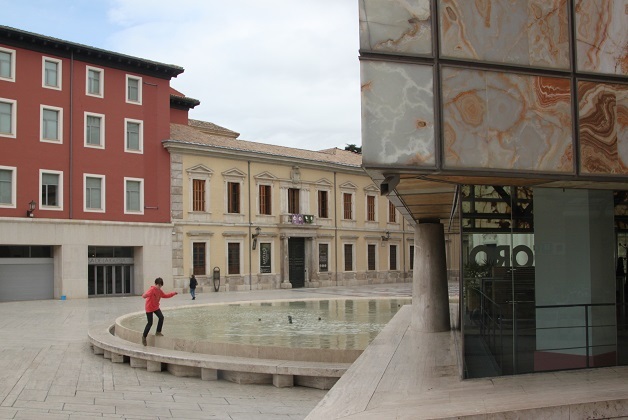 Zatagoza looks like such a beautiful city and I think I would be drawn to the square too – the buildings are magnificent. At first I wasn’t sure if you were in Italy! 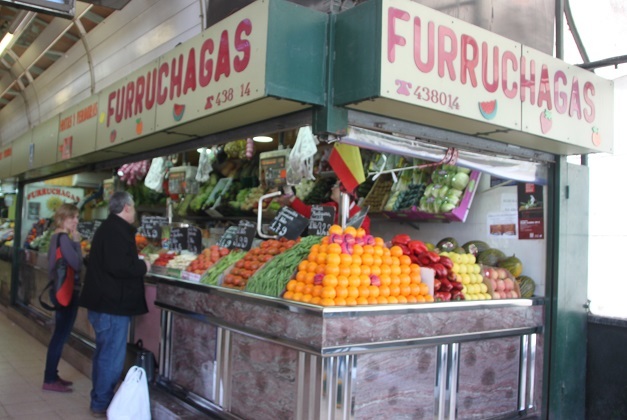 Everything from the ornate streets, and the food market makes this one city I am definitely adding to the list! It’s a real gem – off the beaten track for tourists but so beautiful and if you visit during one of the festivals it’s really incredible. Maybe some day….. it is a gorgeous city and well worth a visit if you get the chance! !